Auto Cap Printer(WE-9160-1 / WE-9160-2) - Guger Industries Co., Ltd. Suitable for various cap printing (Multi colors cap printing can also be designed on request). Custom-made machine is available and welcome. Precise 8 section index with human / computer interface control helps the machine work stable. Imported ceramic ink-cup with steel plate gives prefect printing effects. Large closed feeding machine conforms to the FDA regulation. 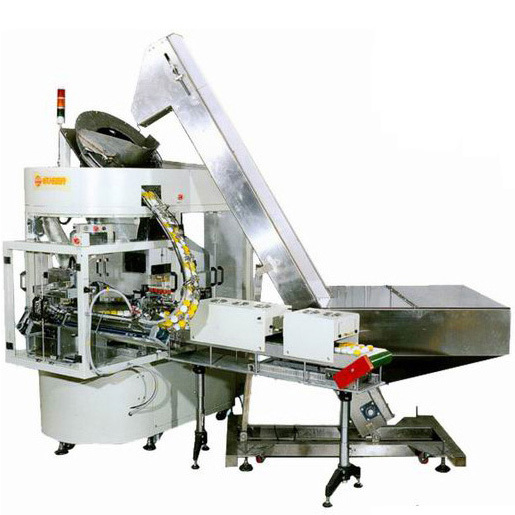 High speed and low noise centrifugal search-side feeding system is used. An optional hot or cool air drying equipment can be mounted to the unloading system.